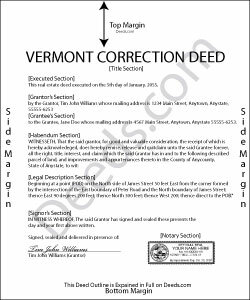 Use the corrective deed to correct an error in a previously recorded deed of conveyance, such as a warranty or quitclaim deed, in Vermont. Apart from supplying the correct information, the new deed must give the reason for the correction by identifying the error. It also must reference the prior deed by title, date, and recording number. The original grantor has to sign again, which confirms the property transfer to the grantee. Generally, corrective deeds are used to address minor errors in a deed, such as typos, accidentally omitted suffixes or middle initials of names, and other minor omissions. When correcting the legal description, both grantor and grantee should sign the corrective instrument to avoid doubt regarding any portions of the conveyed property. For certain changes, however, a correction deed cannot be used. According to Vermont Title Standard 4.1, a grantor, "who has conveyed by an effective and unambiguous deed," cannot use a corrective deed in order to "make a substantial change in the name of the grantee, decrease the size of the premises or the extent of the estate granted, impose a condition or limitation on the interest granted, or otherwise diminish the grant of the prior deed." Material changes of that nature require that the grantee convey back to the grantor before a correction can be applied. When in doubt about the gravity of an error and whether a corrective deed is the appropriate vehicle to address it, consult with a lawyer. Reply from Staff: Thank you Jack. We really appreciate you taking the time to leave your feedback. Have a great day! Teresa H. said: cost effective and quick! Thomas S. said: Very nice. Reply from Staff: Thanks Tracey, we appreciate your feedback. Joyce F. said: The forms are simple to follow. I was hoping I would be able to add my personal info. That would make the forms even more simple. Anita A. said: No review provided.